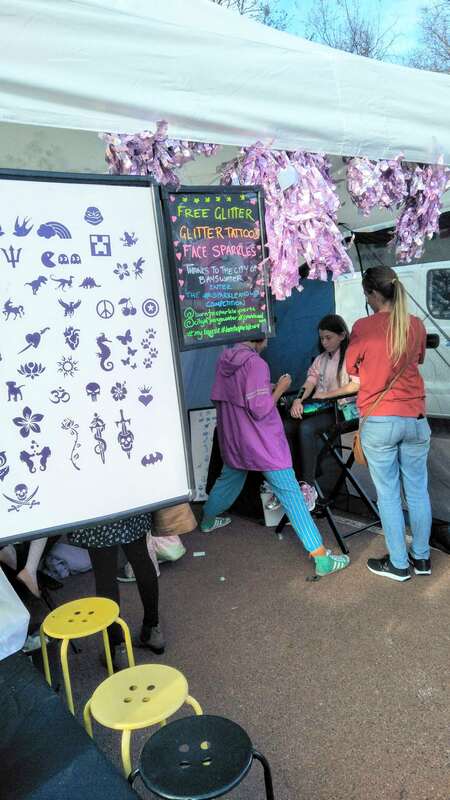 After giving out so many free glitter tattoos and face sparkles at events put on by the City of Bayswater, we’ve realised it’s just the place to be. Bayswater is where it’s at! There’s a genuine focus on community; the council is really committed to providing amazing, inclusive, free events. Every year the City of Bayswater holds an Australia Day event and this January we were asked to join! The Sparkle Crew were amazed at how much free family fun was going on – a barbecue, bouncy castles, camel rides… It was awesome to hear the didgeridoo being played all day as well. Bayswater residents were treated to our free sparkles and a bespoke collection of glitter tattoos custom made for Australia Day. Born to Sparkle have been giving out free sparkles at so many City of Bayswater events this year. The Noranda Sunset Markets was another awesome sparkly evening with food stalls and free entertainment. This was in addition to the annual Evening in the Park, which the community always flocks to. Evening in the Park was a collaboration with Awesome Arts which made for a wonderful night. Smooth Sounds provided the musical entertainment and there were also so many interactive activities for all ages. Older kids got to have fun with Laser Corps and the little ones had an amazingly realistic dinosaur ride! The Sparkle Crew were on hand with glitter makeup artistry, tattoos, face sparkles and gems. It’s honestly astounding to have an insider’s view of the City of Bayswater’s commitment to community engagement. Born to Sparkle was invited to add some magic to an event just recently – the Avon Descent. The 2018 Avon Descent brought competitors from all over the world to Perth for the annual two-day race: 124km of white water and mountain flats. Spectators waiting at the finish line in Bayswater were treated to a brilliant array of free entertainment. There was a petting zoo, remote control car racing, kids’ TV icons bouncing around the place and lots more. All day long people were lining up for their free sparkles and we had such a great time glitterfying so many smiley faces. If you live in Bayswater you’re guaranteed plenty of days out with the family, provided and organised by someone other than yourself! We even had a couple of Bayswater patrons selected as finalists for our #sparkleandwin monthly competition where you can win a Sparkle Party just by sharing a glittery selfie on social media. Born to Sparkle are super excited for our next collaboration with the City of Bayswater! Mrs Sparkles is actually a huge fan of the City of Bayswater’s Instagram and Facebook pages – she follows them religiously. They really show off the vibrancy and diversity of the community in their posts. Not to mention, let you know when you can enjoy a free day out and get one of our new glitter tattoos! You can also keep up with Born to Sparkle on Facebook https://www.facebook.com/borntosparkleentertainment/ and Instagram https://www.instagram.com/borntosparkleperth/ too! Next post Perth Makers Market — Cheers to Sparkling New Lives!